What do you do with half of a day old baguette? In my house we usually throw it away, or save it for the ducks at the park. Well, not anymore; a couple of days ago I was starring at this stale piece of baguette while making dinner and decided instead of being wasteful I would try to make something yummy out of it, I looked in the fridge and found a wedge of double cream Brie and that is when this recipe was born! Preheat oven to 375 degrees. Melt butter in a bowl, add parsley flakes and garlic powder (or minced garlic), mix and set aside. Slice baguette on one side and fill with sliced brie pieces. 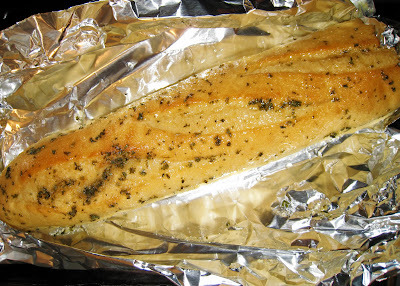 Place baguette on a roasting pan lined with foil. Brush the baguette with butter mixture and fold the foil over the baguette creating a pouch. Bake for 20 minutes or until the bread is golden brown and the Brie has melted. Slice and Enjoy! mmmm! That sounds so delicious. I want to try it! 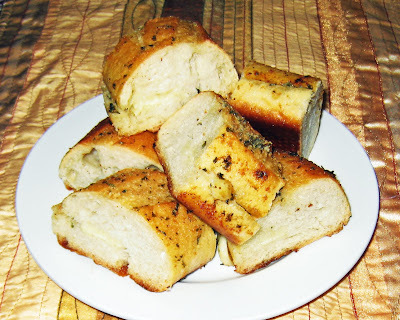 I was going to serve plain ol' garlic bread tonight, for our guest but I'm totally trying this! I happen to have some Brie. Thanks for the tip! Oh. My. That sounds amazing!!! Thanks ladies! It was actually really yummy and the bread softened up nicely. Enjoy!